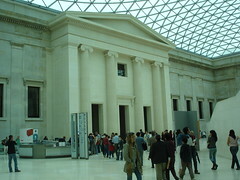 What can one say about the British Museum? Is it grand, inspiring, a wealth of knowledge or cultural theft? All of the above. 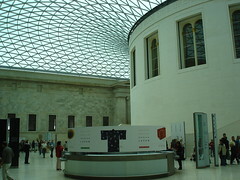 It encapsulates the image of the British Empire with all of its heights of discovery, exploration and construction to the lows of conquest and confiscation. Walking up to the museum you might almost be forgiven for lumping it together with all the other stone buildings in the city, that is until you step inside and feel a weight of history and possibility. Oh and tourists and children, can’t forget them. 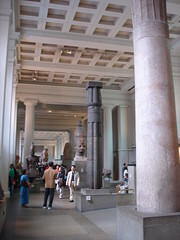 Although it was never crowded, at most a bit busy in some sections such as the Egyptian displays. Walls filled with books and displays satisfied my geek curiosity but left me wanting more! More knowledge, more understanding, more appreciation. I enjoyed the sections dealing with the Ancient Romans, Greeks and Egyptians the most because despite having read about them or the occasional travelling display this was the first time I had the opportunity at seeing an extensive collection. Contrast this with the Museum’s East Asian exhibits (notably Japan) that felt very general – presumably a reflection of geographic proximity and interest. 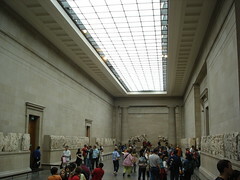 While there is considerable controversy over, for example, the Elgin Marbles and despite there not as many as I’d pictured, the display, in of itself is well done with an impression of walking into a Greek temple…before being carted away by the British. 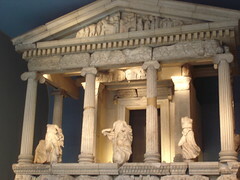 Indeed in several portions of the museum it feels as though you are wandering through the halls of ancient cities. So says someone who has done this so extensively. 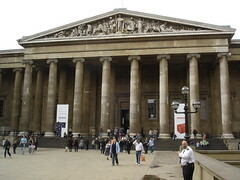 I spent a few hours here and was able to peruse the various galleries although without reading extensively. If you want to read more of the information boards you’ll need probably more time. The combination of walking and reading means that the experience can be somewhat fatiguing albeit worthwhile. Besides a self driven experience you can also get an audio tour, presenters at various times and locations and “touch and feel” history tables where you can hold some (cheap) artefacts. Another note is on photography, unlike other museums there doesn’t appear to be any restriction on taking photos of the exhibits – which is a cool way of experiencing and remembering the museum. Some of the displays didn’t spark my imagination as much as I’d hoped (although this may be fatigue from walking) although others areas did a wonderful job. If you’re a fan of history you’ll find this fascinating and even for those who aren’t passionate about the subject come along and have a browse, you may surprise yourself. The museum is free so what have you got to lose? Though if you enjoy it drop some money into the donation bin.